In fact Billy had to move to Bristol before they married and it may have been this separation, and the threat that it might be permanent following invasion which precipitated the event. In any event his place of abode on the marriage certificate is Woodstock Road, Bristol. 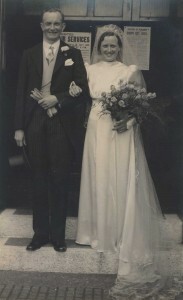 After marriage they settled into a rented house in Russell Road, Westbury Park, Bristol. This part of Bristol was on the flight path of bombers leaving the Bristol area, having dropped their load over the Docks area of the city. They did suffer the occasional stray bomb load, they told stories after the war of extinguishing incendiaries in a bucket of water they kept for the purpose at the front door. Eva also spoke of the occasion she was helping a neighbour who was in bed injured in the dark, because the windows had been blown out and lights were not allowed in the blackout. She rested her tray of bandaged and equipment on what she thought was the bedside table and did what she could for the lady, in the morning she discovered that what she had thought to be the bedside table was in fact the chimney stack which had fallen through the roof narrowly missing the bed. Eventually after at least one narrow escape of a bomb landing outside the front door and failing to explode, their house suffered sufficient bomb damage that they were forced to move. I still have a wooden boxed Music Box that shows the damage received from splinters brick “shrapnel” at this time. They didn’t move far, just a two minute walk away to Howard Road. They spent the rest of the way in this house. 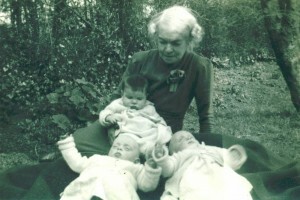 Twins aged 5 months on the ground with their cousin Susan Bradburn also 5 months and their Grandmother Dorothy (Small) Hunter. My father told the story of being on the allotment garden one early October evening and hiding his head in a bucket as a bomber flew overhead strafing anything that moved. Even he wondered afterwards what good the bucket would do! But when he arrived home it was to find Eva in labour for my twin brothers. They were several weeks premature and it was, apparently, touch and go for the two babies, with the midwife advising that the parents concentrate on ensuring that just one survived. 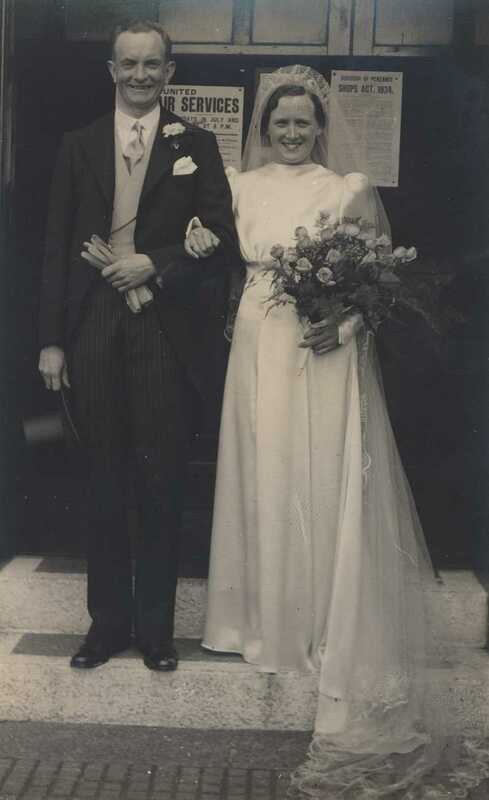 However they and the grandparents persevered and within a short time both were thriving. Before the war ended Eva was to suffer the miscarriage of a daughter who was again due to be born at home but was presented breach. Life might have been pretty austere during the war, but it wasn’t all bad, they liked telling the story of their first Christmas together, when their celebratory meal was a stuffed Vegetable Marrow, or their shared trip on a coastal steamer when it was taken out for a trial after repairs to its war damage and the Captain suggesting they fish with rod & line over the stern, and him making sure they caught a salmon, by way of saying thanks to Billy). 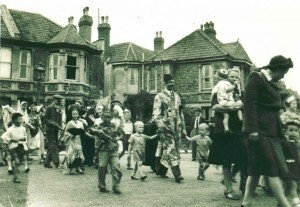 It was also at this time that they took their first holiday in Porlock a small village down the Somerset coast. Billy had had to visit the village to inspect a vessel that had beached there after enemy action, and arranged then to come back for a holiday with the family. But more on Porlock in another blog. The War in Europe ended on 8 May 1945 to the sound of street parades and parties, which the twins Paul and Christopher and their father joined with enthusiasm! Eva did not join the parade, by this time she was expecting her fourth child.